Besides the predefined constants, you can also define preprocessor constants for yourself to automate your preprocessing requirements. Each method produces slightly different results from the other two. First, it is important to understand the mechanics of declaration for each case. After that’s clear, the discussion examines how each method behaves. In the first case, it is not clear what makes 60 a special value; and if the value ever needs to be changed, every conditional that uses it must be changed manually. In the second case, the use of a meaningful constant name clarifies the meaning of the value; and if it ever needs to be changed, a single change to the constant definition propagates the change to all instances of its use. Just like a programming constant, a compiler constant must be defined only once. The syntax for compiler constants is slightly different, however, from programming constants. Although you can optionally specify a data type with a programming constant (if you don’t, the constant defaults to a Variant, or whatever the programmer has specified as a default type via the family of Def statements— for example, DefInt, DefLng, and so on), it is not possible to specify a data type for a preprocessor constant. All preprocessor constants are treated as if they are Variants of type string. MsgBox "You Won’t See Me"
The message box won’t appear because the preprocessor sees the test as –1 = 1, which it concludes is False. If you are accustomed to thinking of any non-zero value as True, this can be confusing. That is why this chapter assigns unambiguous literal values to compiler constants rather than Boolean values. When you try to compile code like this with Option Explicit, VB will tell you that you haven’t declared NothingButACompilerConstant. By now you have certainly noticed the pattern. So long as you don’t mix the stuff you do on lines beginning with pound signs with any of your other code, you should not have any trouble. Just keep track of those pound signs. If you pull down the Project menu and choose Properties at the bottom of the menu list, the Project Properties dialog box appears. If you select the Make tab on the dialog box as shown in Figure 20.22, you will see a field for Conditional Compilation Arguments. 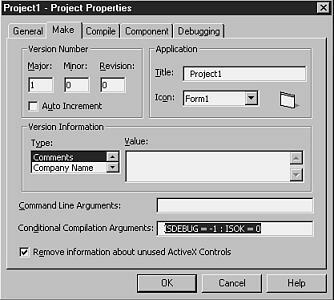 FIGURE 20.22 The Make tab of the Project Properties dialog box. vb.exe /make ProjectName.vbp /d VERSION=2:CLIENT="Pointy-haired boss"
You don’t need to leave a space between the /d switch and the constant, but it makes the example easier to read. Notice how the example defines multiple constants by separating them with colons.